This Friday, March 30th —Pancakes and booze. One night artshow-shindig. This is something completely different for me, in several ways. I have my reservations about this show, but mostly that’s just “inner-skeptic” talking about my own entries into this event and not the event itself. Will something sell? Sure hope so. Regardless, I like pancakes, and to some degree I like booze, so I’m putting on the optimistic face. Then I just signed up for two more shows in the near future –a Garbage Pail Kids show at the Artichoke Gallery in June, and, also in June at the People’s Gallery doing the Landscape show. I am neither a landscape artist or a GPK cartoonist, but here we go, wish me luck! Meanwhile, I’m about to wrap up my experimentation on my Homage to Albers and just produce about 3 to 5 works. I wanted a whole gallery full, but I’ve been having so many problems with this project just to bring it to life, and now that it’s living, it’s not really as great as I intended. The experience with this project has been kinda like buying a house that’s a money-pit. It’s cost me more cash than 2 projects combined would usually cost me, as well as costing me a chunk of sanity a couple times. The BIG take-away from this project has been learning to make films for screenprinting using photocopies and vegetable oil. It works, even with fine half-tone dots! It’s so damn DIY, and “unprofessional” that I’m sure some people are just rolling their eyes, but what’s a poor man to do when he has a large-scale print made all with halftones and no thousand-dolla-film printer? I’m usually the guy at Kinkos piecing together 8 x 11 or 11 x 17 overhead transparencies together, but those little dots are frustratingly hard to piece together correctly, not to mention you’ve got to piece a 2nd layer together that has to fit exactly over the other or no go. Ah, but I could ramble on… Anyhoo, the Vegetable Oil technique works, there’s just a learning curve on your exposure times. 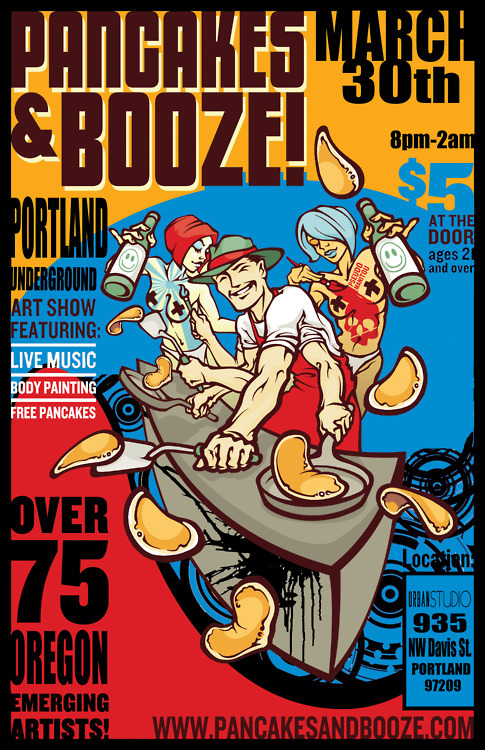 This entry was posted in Uncategorized and tagged Artichoke Gallery, DIY, Pancakes and Booze, Peoples Art of Portland, Screen Printing, Vegetable Oil Transparencies by larrychristensen. Bookmark the permalink.